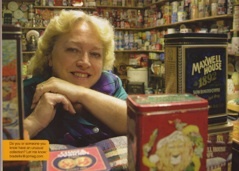 Welcome to Connie’s Advertising Tin Collection. The collection is divided into eight main categories, which are again divided into subcategories. Click on the category name below the picture and go from there. OR, use the alphabetical site map by clicking above this paragraph. Click on text below pictures to read articles. 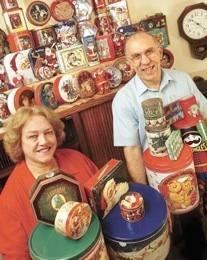 Please note that this collection consists MOSTLY of tins produced from 1980 to the current time, although there are hundreds that predate 1980. We welcome contact from you. Do so by clicking on the “Email me” icon above and to the right. There are over 6500 tins to view. Many tins appear in multiple categories, such as Candy, Christmas, Russell Stover...all for the same tin that fits all of those categories.